"I wish my parents were immortal bloodsucking vampires,” said no one. Ever. Especially not Robyn who is struggling being the only human in a house filled with vampires. Can she keep it a secret that she knows what they are? Meanwhile Jayden’s family is revealing secrets of their own and nothing is as it seems in Shadow Hills anymore. .Who can they trust? 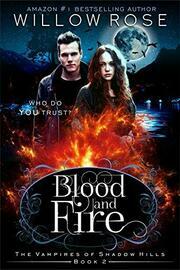 Blood and Fire is the second book in a fun and frightening series of romantic paranormal mysteries. If you like terrifying thrills, flesh and blood characters, and vampires without the sparkle, then you’ll love Willow Rose’s tale of suburban terror.Buy Blood and Fire to discover a dynamic series that puts the bite back into vampire lore today.